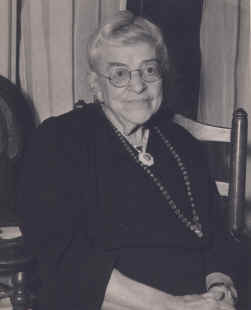 ROSE IDA GOODHIND WOODRUFF was known throughout her life by nearly everyone as "Aunt Rose," whether they were family or not! She was the eldest daughter of RICHARD GOODHIND and his first wife, widow CHARLOTTE MARTIN COOK. She seems to have taken on the responsibility, during her long life, of caring for many other members of the family. Alhtough I was a child, I remember Aunt Rose very well. She was a quiet and reserved woman with a dignified manner. She was loved by everyone. In the summer of 1953, according to my Aunt Pat, she and my grandmother Henrietta (Rose's sister-in-law) drove to South Lee and moved Aunt Rose lock, stock and barrel back to Amherst to live with her half-brother Murray and Henrietta. She was not doing well at the time but that changed completely in Amherst! I can remember her visiting us as a child and then later, we visited her when she was living in a nursing home in South Lee. (She may have moved there after Murray died in 1956. Grandma moved at that time into a much smaller apartment.) Eventually, she returned again to Amherst and lived at Kane Nursing Home on Lessey Street around the corner from my grandmother. It was there she died on December 5, 1967 at the age of 101. 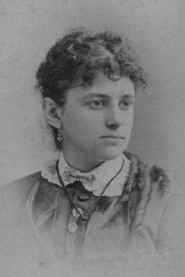 She had been born on March 5, 1866 in Russell, MA. Her long life provided her with vivid memories and interesting insights. Amazing to say, Aunt Rose remembered as a small child (the Civil War having only ended just before her birth) seeing men wandering back through the town of Dalton, MA, some missing limbs, still trying to make their way back to their hometowns following the war. Aunt Rose habitually ate her dessert before her meal, saying "when you get to be my age, you should enjoy your dessert. You might not finish the rest of the meal." "Mrs. Rose Woodruff observed her 100th birthday on Saturday at Kane Nursing Home where she has made her home for four and half years. Among those congratulating her was 101-year-old Mrs. Mary Z. Norman who also resides at the nursing home. She walked down the hall and into Mrs. Woodruff's room and said "Congratulations, glad you made the grade." Mrs. Woodruff, who is better know as "Aunt Rose," received gifts, flowers, cards and a number of birthday cakes. Among her congratulations was one from President Lyndon B. Johnson, Gov. John Volpe, Congressman Silvio Conte, State representative James R. Nolen and county and town officials. A granddaughter, Mrs. McCarthy of Montreal, sent her a birthday cake. She also heard from her son, Howard, 80, a resident of Montreal, who was unable to attend. A niece, Mrs. Warren Sperl of Yarmouthport, came to the occasion. Mrs. Woodruff has six grandchildren, eight great-grandchildren and three great-great- grandchildren." Mrs. Woodruff, Pen Pal to Hundreds, Dies at 101. "LEE - Mrs. Rose (Goodhind) Woodruff, 101, of Amherst known by hundreds [of] pen pals as "Aunt Rose," has written her last friendly letter and sent her last Christmas card. She died Tuesday night in an Amherst nursing home. Noted for her hobby of letter writing, she always started mailing Christmas cards, accompanied by a lengthy letter, early in the fall. In March 1966, when she observed her 100th birthday, she received a shower of congratulatory flowers, gifts and cards from such prominent people as President Lyndon B. Johnson, Gov. John A. Volpe, U.S. Rep. Silvio Conte, State Rep. James R. Nolen and county and town officials. A native of Russell, she spent most of her life in South Lee and Dalton and worked many years for the Myron-Weston Paper Co. in Dalton. She leaves a son, Howard Woodruff of London, Ontario, five grandchildren, nine great-grandchildren and three great-great-grandchildren. Kelly Funeral home, Dalton, is in charge of arrangements. Details will be announced." Aunt Rose was buried with her father and sisters in Fairmount cemetery, Lee, MA. See the Woodruff Family Photo Album!